"Punk meets hip-hop, gay meets straight, black meets white, and downtown party meets uptown art world—influences that made Jean-Michel Basquiat the man he was." This Saturday, the 23rd, The Broad's Summer Happenings comes to an end with a final event honoring Jean-Michel Basquiat. The late night event (8pm-midnight) will have music, performance, and full access to the museum. The event will be a classy soirée filled with music, culture, beauty and art. 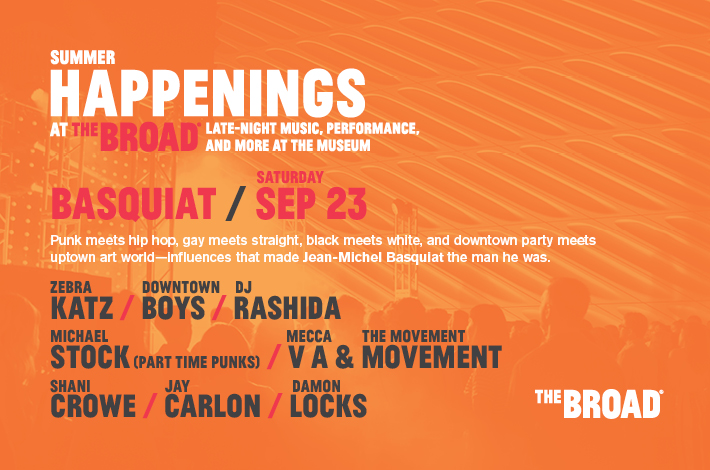 Live performances by DJ Rashida, Michael Stock, Downtown Boys, Zebra Katz, and more.